Editor's Note: Please see part one of this two part series comparing the Samsung Galaxy S4 and the iPhone 5 here. Also, please check out our two part series comparing the HTC One and the Samsung Galaxy S4: Part one and Part two. The smartphone war continues and the battle between Apple and Samsung doesn't seem to be ending anytime soon. Nevertheless, it looks like the majority of gadget enthusiasts are rooting for the Samsung Galaxy S4 this year, and for good reason. Pacific Money recently analyzed the hardware that powers both the iPhone 5 and the Galaxy S4, and while Apple's flagship has its charm, the SGS4 manages to overshadow its competitor in many regards. However, there is more to a smartphone than its hardware. After all, everything is being kept together by software and one can't go without the other. 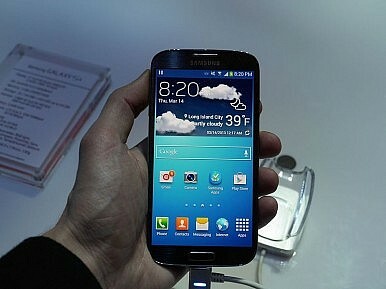 That being said, part two of The Diplomat's Samsung Galaxy S4 vs. iPhone 5 miniseries will focus on the software side. Can Apple win this round and redeem itself? There is only one way to find out. It is a well-known fact that many Android smartphone manufacturers have a tendency of creating their own user interfaces to go on top of the "vanilla" Android UI. The main reason for this is because most want to create a product that stands out from the crowd, not only in terms of hardware and design, but also in terms of software. Applying a new user interface gives the brand its own identity. Also, by doing so, manufacturers get the chance to add certain software features of their own. Whether or not this method is beneficial for the end user is a different matter altogether. Some claim it is, while others tend to prefer the "unaltered" Android experience. Samsung fits in the category of manufacturers that deliver a "heavy" UI and the Galaxy S4 is a prime example of that. The TouchWiz Nature UX is layered on top of Android 4.2.2, offering a "nature-inspired" design and many interesting and rather unique software features. These range from widgets, custom lock-screens and home-screens, to full-fledged applications such as S-Translate, S-Health, and Group Play. The iPhone 5 on the other hand comes with vanilla iOS. iOS 6 is very user-friendly indeed. The UI is easy to understand. It's also very fast and responsive, but on the other hand, this simplicity comes at a cost, as it renders the UI dull and almost non-customizable. There are no widgets, no live wallpapers and there's no possibility of using a different launcher. When purchasing a new smartphone, one might also want to consider the ecosystem. In this case, buying a Samsung Galaxy S4 will give you access to the Google Play Store, whereas with the iPhone 5 you'll take advantage of the App Store. In theory, both services offer the same thing: applications for your smartphone. In practice, the ecosystems differ greatly. While the Google Play Store is a more "open" platform, allowing a myriad of app developers to publish their creations, the App Store is stricter and the approval process for an application takes much longer (this being one of the reasons why many users are always looking for "Jailbreaking" solutions). This is arguably a good thing, mainly because there's a stronger sense of quality reassurance on the App Store (although it had its fair share of backfires). On the other hand, with the "openness" of the Play Store, Android users have many more free apps at their disposal, ranging from office applications and games, to ways and means of customizing the user interface. Nowadays, smartphones fit the role of point and shoot cameras more often than not, which is the reason why the camera application of a handset is as important as the sensor itself. The iPhone 5 benefits from one of the best cameras around, but when it comes to the actual camera software app, there's not that much to say. The Galaxy S4 on the other hand offers a lot more features and gives the user access to more settings. Options such as Dual Shot, Erase Mode, Sound & Shoot and a user interface that has been borrowed straight from the Samsung Galaxy Camera (the actual point-and-shoot device), make the S4 a much better choice for amateur photographers who like to fiddle with tons of camera settings. Both smartphones deliver a solid user experience and each device has its place on the market. In a nutshell, iPhone 5's software features are simpler yet more user friendly, while the Galaxy S4 delivers more versatility and eye-candy. Nevertheless, the iPhone's user-friendliness might not be enough to balance out Galaxy S4's flexibility and richness in terms of software. Don't forget to share your own thoughts in the comment section below!